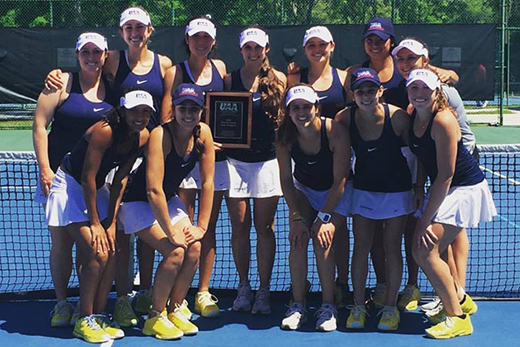 The Emory women's tennis program won its fourth-straight UAA championship and the 27th overall in program history on Sunday afternoon. 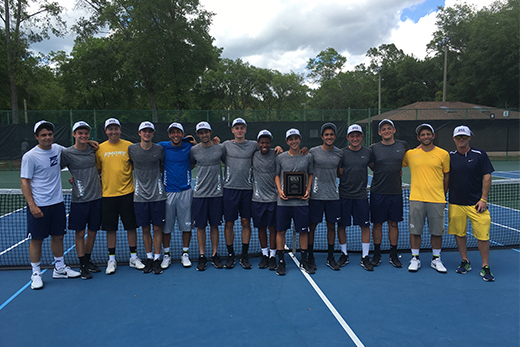 Emory's tennis teams swept the University Athletic Association championships held over the weekend at Sanlando Park in Altamonte Springs, Florida. The Emory women's tennis program won its fourth-straight UAA championship and the 27th overall in program history on Sunday afternoon, while the Emory men's tennis team defended its UAA championship on Saturday, representing the 25th time that the Emory men had won the league crown. The top-ranked and top-seeded Emory women's team knocked off 12th-ranked and third-seeded Washington University, 7-2, in the title match. Emory moves to 23-4 overall on the season, tying the 2010-11 squad for the third most victories in a single season. The Eagles began the match by taking two of the three doubles matches. Juniors Paula Castro and Michelle Satterfield gave Emory a 1-0 lead, winning by an 8-1 margin. The Bears tied it at 1-1, but then junior Katarina Su and sophomore Bridget Harding claimed their doubles match 8-5 to give the Eagles a 2-1 edge heading into singles play. Emory began singles action by winning two of the first three matches to extend its lead to 4-2. Freshman Taylor Cosme won her team-leading 28th singles match and senior Beatrice Rosen posted a 6-0, 6-0 shutout. The clinching point for the Eagles came from Castro as she lost just one game en route to a 6-1, 6-0 victory to seal the title for Emory. Satterfield and senior Madison Gordon each turned in wins of their own to provide the 7-2 final margin. Emory will close out the regular season next Sunday, May 1, with the final match of the regular season against top-NAIA program Georgia Gwinnett College. The match is scheduled to begin at noon and will be held on the Woodruff P.E. Center Outdoor Courts. The Emory men's tennis team successfully defended its UAA championship on Saturday, representing the 25th time that the Emory men won the league crown. The Emory men's tennis team also successfully defended the UAA Championship, defeating Washington University in the finals of the conference title match. The No. 1-ranked Eagles captured their seventh consecutive match and raised their overall record to 20-3 following a 6-3 triumph over the No. 7 Bears. Emory trailed by a 2-1 margin following doubles play, with the team of senior Rafe Mosetick and freshman Jonathan Jemison accounting for the team's point, upping their season record to 17-3 overall. The Eagles clawed back in singles, capturing five of the six matches. Mosetick knotted the match score following his 6-3, 6-1 triumph, his 24th victory in 30 decisions this year. Freshman Adrien Bouchet gave Emory the lead for good when he won his match 6-0, 6-3, raising his season mark to 21-7. Junior Aman Manji came through with the clinching point with his 7-5, 6-3 victory — his seventh-straight triumph, and his 19th successful decision in 24 contests this year. Freshman Andrew Harrington recorded the other singles point, winning a 2-6, 6-4, 6-3 battle.